If you are looking for a change of pace from the sleepy, quaint towns of Manuel Antonio & Quepos, then we have just the adventure for you! Our Manuel Antonio white water rafting tours take you down the river to explore more of Costa Rica in a wet and wild adrenaline pumping way. 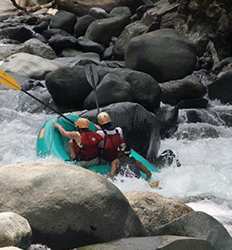 The Real Deal Tours offers not one but two different river rafting tours in Manuel Antonio that cater to your adventurous spirit. If it's your first time river rafting, we recommend the Savegre River with its Class II and II rapids. More experienced rafters will enjoy the heart-stopping thrills of Class III & VI rapids of our Naranjo River Rafting tour where if you listen, you may just hear the sounds of howler monkeys egging you on! Whichever Manuel Antonio whitewater rafting excursion you choose, our bilingual river guides will make sure you understand the ropes before launching off in your raft. 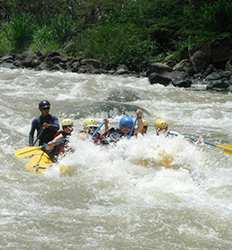 There is excellent river rafting in Costa Rica, & Manuel Antonio Whitewater Rafting offer something for all skill levels. Below we have listed your options for whitewater rafting tours departing from Manuel Antonio & Quepos. Enjoy a mellow class II/III river run, or challenge yourself on an adventurous class III/IV whitewater rafting adventure, the choice is yours!